After a celebrated career in the war against Napoleon, Captain Douglas Bowden moves to a small fishing village to escape military life and put his medical skills to good use. Little does he know, it's his heart that needs the most loving care. This brand-new novel from master storyteller Carla Kelly will have new and longtime fans in raptures! 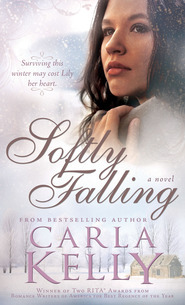 I am a big fan of clean historical romance and Carla Kelly is one of my favorite authors. In Doing No Harm, Kelly demonstrates once again her mastery of the genre. I loved pretty much everything about this novel. The setting (Scotland), the characters (Doug and Olive as well as Flora, Tommy and all the others), and the plot (helping Scottish Highlanders who've been driver from their homes). I thoroughly enjoyed meeting Douglas Bowden, a retired Naval surgeon in search of a 'quiet, peaceful country' medical practice. But when he comes across a young boy with a broken leg, he can't help but respond. And as he gets further involved in the heartbreak of Edgar he can't help but try to ease the suffering he sees. He teams up with local teashop owner Olive Grant to find a solution. I loved the way that Doug and Olive come together to help not only each other (Doug has nightmares from his decades at war and Olive is running out of money) but the whole village. Before reading this book, I'd never heard much about the Scottish Highlanders being run off their homesteads to make way for sheep so the book was rather enlightening in that regard. It saddens me to continually be reminded of how cruel people can be to each other, but Doug and Olive are the kind of characters that also remind me that there is still much good in the world. A touching, sweet romance combined with a powerful historical context creates a book well worth reading. I highly recommend it.